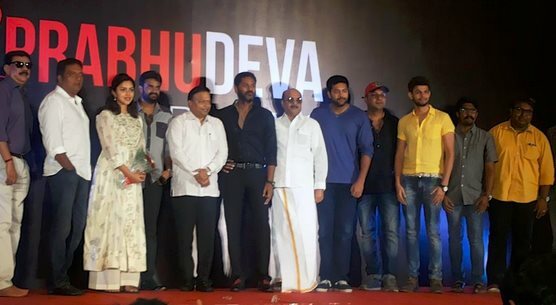 The legendary actor and dance guru Prabhu Deva launched his production house Prabhu Deva studios this morning. At the launch of the studios, it was officially confirmed that Romeo Juliet team will come together again for JR20 (Jayam Ravi's 20th film) & this time with Prabhu Deva. Prabhu Deva will be producing a film that will be directed by the Romeo Juliet fame Lakshman. The multi-talented Prabhu Deva has launched his production house and has roped in Lakshman to direct a film for his banner. While Jayam Ravi is on board this multi-starrer, the director is in talks with other leading heroes to play the lead role. The news is that it could be either Vijay Sethupathi or Arya. Details regarding this project will be announced very soon, report sources. In the previous years, Prabhu Deva has impressed us as a dancer, choreographer and also as an actor. Well, it now seems like Prabhu Deva is all set to make waves in the industry as a producer too. The production house is said to be a team of highly-qualifies professionals with a great deal of experience. the ace choreographer aims to produce films in different languages under the banner of Prabhu Deva Studios. “Prabhu Deva Studios has a determined vision of producing high- quality and content-oriented films. We will be widening our horizons to other language films too,” says report. Actor-filmmaker Prabhudheva will be producing three yet-untitled Tamil films under his home banner Prabhudeva Studios. One of these projects will be with veteran filmmaker Priyadarshan. "I'm really proud to be associated with filmmaker Vijay's Think Big Studios for Priyadarshan sir's next film. I'll be co-producing the film with Vijay," Prabhudheva told reporters. The other two films include a multi-starrer with director Lakshman of "Romeo Juliet" fame and another project with debutant director Victor Jayaraj, a former associate of director Vijay. The project with Lakshman will feature Jayam Ravi in the lead. Prabhudheva also said that Priyadarshan's film, which will be about AIDS awareness, will go on the floors later this month. It will feature Prakash Raj, Sriya Reddy and Ashok Selvan in the lead roles. In Bollywood, Prabhudheva awaits the release of Akshay Kumar-starrer "Singh Is Bling". Prabhu Deva is all set make an important announcement very soon. Sources are rife with the news that he will soon float his own production house, Prabhu Deva Studios and is planning to produce five films under this banner. Being a very busy director in Bollywood right now, it needs to be seen if he would produce Hindi, Tamil, Telugu, Malayalam or Kannada films.